PHOENIX (AP) Credit the Charlotte Hornets’ bench for the team’s biggest comeback victory of the season. 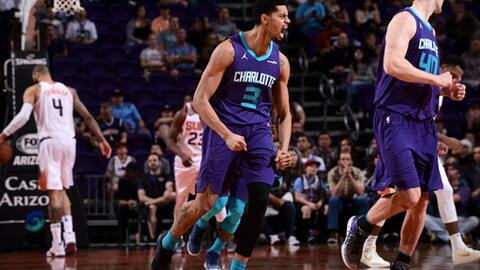 The reserves ignited a 20-2 run to start the fourth quarter and Charlotte rallied from a 21-point second-half deficit to beat the Phoenix Suns 115-110 on Sunday. Nicolas Batum scored 22 points to lead Charlotte while Howard and Kemba Walker had 18 apiece. But none of them scored in the fourth, when the Hornets roared back. Charlotte’s reserves outscored their Phoenix counterparts 45-27. Over a 13-minute stretch in their comeback, Charlotte outscored the Suns 48-18. Bender’s driving dunk cut it to 112-107 with 1:31 left before Graham sealed the win with a 3-pointer with 34.8 seconds to play. Graham scored eight of his career-best 15 points in the fourth quarter. Jeremy Lamb also scored 15 for Charlotte. Phoenix made four consecutive 3s – two by Booker, one by Warren and one by Bender – to take that 78-57 lead. Charlotte whittled it to 94-86 entering the final quarter. The Suns turned the ball over the first three times they had it in the fourth quarter. Charlotte made of 25 of 29 free throws, Phoenix 13-of-13. Hornets: Walker broke the franchise career record for 3s with 930, surpassing the record of 929 held by Dell Curry. … After scoring a franchise-record 49 points in a win over Indiana Friday night, Charlotte scored 48 in the first half on Sunday. … Charlotte had a 26-6 advantage in second-chance points. … Howard earned his 700th career double-double. Suns: Jackson had his fourth straight game of at least 20 points. … Booker made didn’t shoot a free throw, so his string of consecutive makes from the line remains at 60. It’s a franchise record for a single season. The Suns’ overall record for consecutive free throws made is 74, spread over the 2006-07 and 2007-08 seasons. … Phoenix made 15 3s (in 29 attempts), two off their season best. … Suns made seven field goals and committed seven turnovers in the fourth quarter. Suns officials would not use the word ”suspended” in describing why Chriss would miss Monday’s game. General manager Ryan McDonough called it ”a cooling-off period.” The team did not explain what Chriss did but ESPN reported he had a verbal confrontation with the Suns’ strength coach. The second-year forward has started 40 games this season.